Herman's Hermits are an English beat (or pop) band, formed in Manchester in 1964. Their first hit was a cover of Earl-Jean's "I'm into Something Good" (written by Gerry Goffin and Carole King), which reached No. 1 in the UK Singles Chart and No. 13 in the US in late 1964. They never topped the British charts again, but had two US Billboard Hot 100 No.1s with "Mrs. Brown, You've Got a Lovely Daughter" (originally sung by Tom Courtenay in a 1963 British TV play) and "I'm Henry the Eighth, I Am" (a British music hall song by Harry Champion dating from 1911, which Peter Noone's Irish grandfather had been in the habit of singing when Noone was young). These songs were aimed at a US fan base, with Peter Noone exaggerating his Mancunian accent. The group appeared on The Ed Sullivan Show, The Dean Martin Show and The Jackie Gleason Show. Continued success in the US proved elusive beyond 1967, although they had as many Top Ten hits in Britain (five) in the period 1967 through 1970 as they had had there in the years of the mid-'sixties when the band were wowing American audiences and British audiences seemed more diffident. By the time the group recorded their final album of the 1960s, Rock 'n' Roll Party, the band's success in the US was history and the album was not released by MGM there. Peter Noone and Keith Hopwood left the band in 1971. Herman's Hermits reunited in 1973 to headline a successful British invasion tour of the US culminating with a standing-room-only performance at Madison Square Garden and an appearance on The Midnight Special (without Hopwood). Later, a version of the band featuring Leckenby and Whitwam opened for The Monkees on reunion tours of the US. Noone declined an offer from tour organizers to appear, but later appeared with Davy Jones on a successful teen-idols tour. Karl Green began performing again in 2014, playing the hits of Herman's Hermits for the first time since 1980. 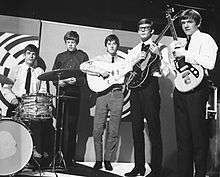 Herman's Hermits was formed from two different local bands. Keith Hopwood (rhythm guitar, backing vocals), Karl Green (lead guitar, backing vocals), Alan Wrigley (bass guitar, backing vocals), Steve Titterington (drums), and Peter Noone (lead vocals) came from the Heartbeats. The second-youngest member of a young group (four months older than Karl Green), 15-year-old Noone was already an experienced actor on the popular British TV soap opera, Coronation Street. Derek "Lek" Leckenby (lead guitar) and Barry Whitwam (drums) (born Jan Barry Whitwam, 21 July 1946, in Prestbury, Cheshire) joined later from another local group, the Wailers. Whitwam replaced Titterington on drums, Green switched to bass guitar (replacing Wrigley), and Leckenby took over for Green as lead guitarist. After Leckenby joined the band, the group made a deal with producer Mickie Most and signed with EMI's Columbia label in Europe and MGM Records in the United States. Their name came from a resemblance, noted by a publican in Manchester England between Noone and Sherman in the Rocky and Bullwinkle cartoon. Sherman was shortened to Herman, and then became Herman and his Hermits, which was soon shortened to Herman's Hermits. The band played on most of its singles, including "I'm into Something Good", "Listen People", "Can't You Hear My Heartbeat", "Leaning on a Lamp Post", "Mrs. Brown, You've Got a Lovely Daughter", "A Must to Avoid", "You Won't Be Leaving", and "I'm Henry VIII, I Am" (the last said at the time to be "the fastest-selling song in history"). Leckenby soloed on "Henry", and Hopwood played rhythm guitar on "Mrs. Brown". Despite the group's competent musicianship, some subsequent singles employed session musicians – including Big Jim Sullivan, Jimmy Page, John Paul Jones, Vic Flick and Bobby Graham – with contributions from the band, although the role of session players on Herman's Hermits records has been exaggerated in the rock media and in liner notes on their ABKCO Records Retrospective (which does not credit the Hermits' playing). Mickie Most used session musicians on many records he produced — this was industry practice at the time. And the practice continues today! Even such respected groups as The Yardbirds were required by Most to use session musicians (except Jimmy Page) on their Most-produced recordings. Continuing acrimony between former members of Herman's Hermits has increased the amount of misinformation about the group's role on their records; the late Derek Leckenby, in particular, was a skilled guitarist. Mickie Most commented on the VH1 My Generation: Herman's Hermits episode that the Hermits "played on a lot of their records, and some they didn't." The group played on all their US and UK No.1 hits ("I'm into Something Good", "Mrs. Brown, You've Got a Lovely Daughter" and "I'm Henry VIII, I Am"), on most of their Top Ten US singles, on a number of other singles and most album cuts. According to Peter Noone, Leckenby played the muted lead on "This Door Swings Both Ways". The riff in "Silhouettes" has been variously credited to Jimmy Page, Big Jim Sullivan and Vic Flick; however, according to Keith Hopwood and Karl Green, Leckenby replaced Flick in the studio and played the signature riff under Most's direction. According to Hopwood, Green and Noone, Jimmy Page played on the single "Wonderful World" (although Big Jim Sullivan lists the song as part of a session he played); both may have added to the backing track. Several writers have claimed that session players played on "I'm into Something Good"; according to the surviving band members, the song was recorded on a two-track recorder, with only a piano player in addition to the Hermits. In 1965 and 1966, the group rivalled The Beatles on the US charts (though not nearly as successful in their native UK) and was the top-selling pop act in the US in 1965. On The Beatles Anthology video, there is a brief interview with a young girl in the audience attending The Beatles' second appearance at Shea Stadium, which was in 1966. A single data point is that she asked why The Beatles did not sell out the venue this time, she replied that they were not as popular any more and that she preferred Herman's Hermits. Karl Green has noted that he preferred harder rock, but was grateful for the hand he was dealt. The band's singles were written by some of the top songwriters of the day, but Noone, Leckenby, Hopwood and Green contributed lesser-known songs such as "My Reservation's Been Confirmed", "Take Love, Get Love", "Marcel's", "For Love", "Tell Me Baby", "Busy Line", Moon Shine Man", "I Know Why" and "Gaslight Street". "I Know Why" enjoyed a limited "A"-side release. The group was nominated for two Grammy awards in 1965 for "Mrs. Brown, You've Got a Lovely Daughter". According to Noone and Hopwood, the song was recorded as an afterthought in two takes – using two microphones, with Hopwood on guitar, Green on bass guitar and Whitwam on drums. Noone and the band deliberately emphasised their English accents on the record, never intended to be a single. Hopwood recalls playing a Gretsch Country Gentleman guitar in the studio, with its strings muted to create the distinctive sound. When playing the song live Hopwood often used a Rickenbacker guitar with a rag under the bridge to duplicate the sound, which can be seen clearly in old performance clips. Ray Davies of The Kinks wrote "Dandy" – a 1966 US Top Five hit for Herman's Hermits. Graham Gouldman wrote "No Milk Today", Herman's Hermits first UK Top Ten hit in over a year in late-1966, backed with "My Reservation's Been Confirmed". The 1967 album Blaze received critical acclaim, but barely made the Top 100 in the US and was not released in the UK. Highlights according to some included original songs by Leckenby, Whitwam, Hopwood, Green, and No_one, including "Ace King Queen Jack" and the psychedelic "Moon Shine Man". Hopwood and Leckenby eventually started a music company, Pluto Music, which is still in business as of 2011 working primarily on commercial and animation soundtracks. Hopwood has since become a composer of scores for film and television. Green has become a manager of sound systems for concert venues along London's South Bank. Leckenby died of non-Hodgkin lymphoma in 1994, leaving Whitwam as the only continuous member of the band. He continued to tour with Herman's Hermits joined by new musicians. As of 2016, these include Geoff Foot, who has toured with the band since Green's departure in 1980, as lead singer and bassist, Paul Cornwell on lead guitar and backing vocals, and Paul Robinson on keyboards and backing vocals. Noone eventually returned to touring and continues to play billed as "Herman's Hermits starring Peter Noone". Legal disputes between Whitwam and Noone have forced the former to rename the band "Herman's Hermits starring Barry Whitwam" when they tour in North America, but they remain billed as "Herman's Hermits" worldwide. In March 2015, the German label "Bear Family" released a 2-CD "50th Anniversary" set containing 66 of their most significant recordings. 59 of them are in first-time-ever stereo, mixed by Ron Furmanek, a well-known CD reissue producer. 1992- "Live in Salem, Oregon"
Original members are listed in bold. ↑ Allmusic.com biography. Retrieved 7 March 2011. ↑ "Herman's Hermits – Magazine Articles". Hermanshermits.com. Retrieved 31 October 2011. ↑ MacInnes, Colin (1965) "The Old English Music Hall Songs Are New." The New York Times, 28 November 1965, p. SM62: "Henry—which hit the top of the record lists and, according to one American expert, was 'the fastest-selling song in history'—was in fact an old English music hall song enjoying a new lease on life." ↑ Classicbands.com Retrieved 7 March 2011. ↑ Joel Whitburn (2003). Top Pop Singles 1955–2002. Menomonee Falls, Wisconsin: Record Research, Inc. p. 312. ISBN 0-89820-155-1. ↑ "Big L RSL 2001 in Clacton – Photogallery of the Stars". Radiolondon.co.uk. 6 January 1965. Retrieved 31 October 2011. ↑ "Hermits stateside for Riverfest, other shows". MyWebTimes.com. Retrieved 10 April 2012. Wikimedia Commons has media related to Herman's Hermits.